Traces the development of science and the discoveries that have made man unique amoung animal species. This is not just a book about science. It is a book about why science matters, and what it really tells us. That is not a message likely to go out of date in a few decades. An extraordinary book by an extraordinary mathematician, scientist and philosopher. Also a stunning PBS series available at many public libraries. I love Bronowski's take on the world. Such an astute and loving eye cast on human achievement. I have loaned this one out several times. It's an accessible introduction to intellectual history. The late 1960s and early 1970s saw the rise of the blockbuster documentary series, such as 'The World at War', with Laurence Olivier's chilling narration, 'Alistair Cooke's America' and 'Civilisation', presented by Lord Kenneth Clark (father of the scurrilous diarist, Alan Clark). Professor Jacob Bronowski, renowned principally as an academic mathematician, conceived his own series, 'The Ascent of Man' as a match for Clark's 'Civilisation', presenting the development of human understanding and application of science. The book is an almost verbatim transcription of Bronowski's series which was notable for his clear, readily accessible explanations of seminal moments in the history of scientific progress right from the earliest exploits of primeval man, through to theoretical physics and the commencement of the exploration of space. Even more impressive was the fact that most of Bronowski's eloquent disquisitions were entirely unscripted. Though his own discipline was that of mathematics, Bronowski displays an enviable ability to convey complicated subjects in a manner understood by the layman. He is not reluctant to take on some of the more complex and daunting subjects, but he manages to render even Einstein's theories of relativity into a sufficiently digestible form. Interesting but full of misinformation. 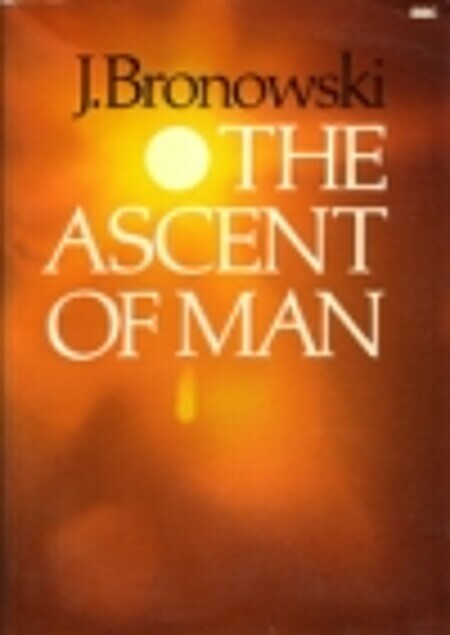 J. Bronowski’s The Ascent of Man, what a wonderful piece of work. If my library caught fire this is the book I would grab, if I could, as I ran out.